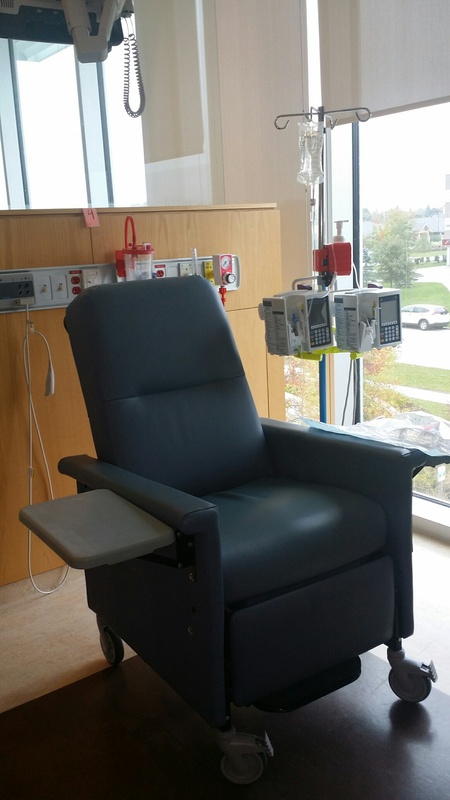 One of the stations for chemotherapy at our local hospital. Lots of windows and natural light. We are back at it again today. At the hospital in the Chemo Suite. Interesting how next to no one here wears a mask and yet all around us people are sneezing and coughing. Not my husband – he wears his mask throughout the whole process. It is cold and flu season so why take chances? My husband woke up with very high blood pressure – remarkably high 172\94. He slept poorly and it showed. He is more anxious this time than for any other treatment. This is because of the blood clot and the fact that he had three weeks of feeling lousy after treatment 2. It was hard to get him going and out the door this morning needless to say. Fortunately we have a very professional nurse today – very informative. You can tell she loves her job. We spoke about the blood clot and his concern about some slight swelling he has had in his other foot – could it be another clot? The nurse said it was likely just some fluid retention and would be highly unlikely that another clot had formed since he is on a high dose of Fragmin which should prevent the existing clot from worsening and the body from making more. I watch as the chemo drug flows into his body and see his colour go from healthy to an ashen waxen colour. His body language is remarkably telling too, his shoulders slump and he appears very fatigued. By the time the treatment is over it has been five hours and he is beat. We pack up and head home. No formal dinner tonight, whatever I can get into him I feel lucky about. So two bowls of soup, one slice of bread, a couple cups of tea and that’s about it. I’ve got jello ready for later if he fancies something. It’s likely fluids for the rest of the evening – but at least it is some sort of nourishment. We have the visiting nurse coming to the house tomorrow to do a litre of hydration – very slowly, at least a five hour drip. This is in deference to the blood clot. To allow his body to process the fluids a bit better. As always I am thankful when we successfully get through each day (and night).